It is the Wild West. Gun drawn and at the ready, you prepare yourself for the next unfortunate collection of words to stumble across your path. You level your pistol, fire, and branch off to the next bit of narrative. This is Words Must Die. Words Must Die is what happens when a first person shooter and visual novel have a beautiful baby. Everything is solve by shooting. Nasty Jack is giving you trouble! Will you shoot his gallbladder or appendix? Fire a shot into the most expensive vodka at in the saloon? The choice is yours as you shoot your way through the story. By the end of it all, parts of the story literally lie dead on the ground. I’ve taken to calling it Read Dead Redemption. You can download the game for PC or Mac. The entire affair is a farcical romp through western cliches and absurdist violence. Everything is chaos and gunfire and snark. My playthrough ended in tragedy. 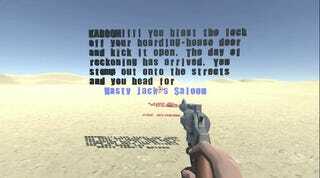 As Nasty Jack and I bled to death, I raised my gun in one last act of defiance and shot my foot. It’s just that kind of game. The concept is fun and the writing is hilarious. I definitely suggest you sit down and blast your way through this awesome experience.